Posted on 01/17/2019 , updated on 02/26/2019 by KWLS Admin. 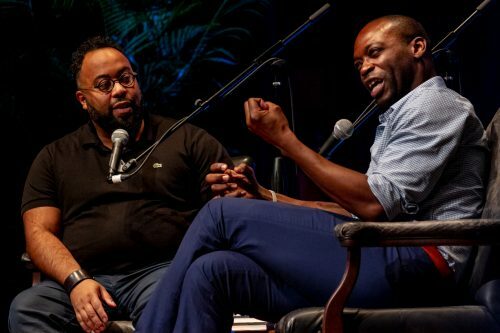 As Kevin Young and Rowan Ricardo Phillips took the stage, James Brown poured out of the PA. Outside the San Carlos Institute just before 6 pm, dusk’s soft glow fell over Duval St., where a decidedly different type of music played across the street. Almost as soon as Young asked the technician to cut the music back inside, the audience was laughing. Phillips and Young were, too. They were parsing the idea of how art aspires to be music and more specifically how their own poetry related to music. To say the two poets are charming would be an understatement. Much of the audience must have felt as though Phillips and Young were seated next to them at the bar or a park bench, and they were eavesdropping. But as Phillips said, “We’re among friends.” And as they went back and forth, it reminded me of reading an essay. Each question leading to another. Each answer or lack of one generating the sense that you were watching an idea take shape. “All art constantly aspires to the condition of music,” Walter Pater said. Young echoed the sentiment, and the two joked about how everything—film, lyrics, conversation—is deemed poetry, except for poetry of course. Phillips read his poem “Violins.” Young read “LITTLE WING.” The two talked of Langston Hughes’ “The Weary Blues.” They talked of the envy of musicians evident both in those lines and amongst each other. They noted its immediacy, its ability to evade language, and spoke to the power in its wordlessness. Young figured that was something a poem gestures towards: “wordlessness.” Piece by piece, the connective tissue between poetry and music emerged. In letters and line breaks that stake out the shape of our lives, Phillips and Young likened the compositions of poems to songs. How do you modulate in poetry, Phillips asked? Young positioned the reader like a composer, the thing that allows air into the work. The two talked of how titles—as a device—hemmed in the poem, lending it an atmosphere. But as the conversation moved along, it was the connection between poetry, music, and memory that carved out the most real estate. “Music isn’t simply music,” Young said. “It’s memory. It’s connecting us to our past.” He noted a trip to Europe where preceding the trip everybody was hyped on Nirvana, and when he returned, Pearl Jam had become the omnipresent sound. He thought back to his poem, “De La Soul is Dead,” talking about the period when the album was released and the memories it conjured up for him. Writing those poems “was a way to return to a time I didn’t know I hadn’t remembered,” he said. The negative space on the page, the composition of the couplets, was like the thin space between the tracks on the album. In our mind, those things formed a link back to when we first read a poem or heard a song, or that summer we played the album on repeat, or couldn’t put down a collection. What was interesting was how our memories of an album or a poem were always different, and how a song that spoke to a poem or a poem that referenced a song became this place where the reader or the listener’s memory pressed up against the author’s. In turn, that song or poem became a marker or maybe a waypoint, our personal memory spilling into the collective one. Phillips noted how growing up we inherit certain kinds of music from our parents, our pasts, and even the color of our skin. In that, it seemed that the same notes or poems—depending on who read or heard them—carried portions of our country’s past, its heritage, our personal histories, too. Memory was inextricably bound to that notion, and that’s to say that music and poetry make up that record—confirm what we’ve inherited. Listening to them, a deep well of curiosity hung over me like the perfume of rum and tobacco back outside. Then, a member of the audience asked whether putting down lines served as a way to remember something or if it was a means to make a memory. The crowd fell silent, and we leaned closer. Young and Phillips smiled then chewed on it for a moment. With that, a slow jam blanketed the audience, marking one more memory. Michael Adno is a writer living in New Orleans, Louisiana. He contributes regularly to the New York Times, and his work has appeared in the Bitter Southerner, the Oxford American, and the Surfer’s Journal, among others.